With MODFLOW-USG boundary conditions are still defined at the cell-center, as with structured versions of MODFLOW. One of the biggest advantages of UnStructured grids is that the cell sizes can be much smaller around these boundary conditions, providing for a higher level of accuracy and better representation. The other major differences lie in the way boundary condition cells are identified. With Structured MODFLOW (-2005, etc. ), boundary condition cells are identified by row, column, layer, in their respective packages (.RIV, .WEL, .GHB, etc.). With MODFLOW-USG, cells are identified by a CellID; after that, the parameters remain the same as what you see for Structured MODFLOW. The CellD label for boundary condition cells can be turned on as described below. 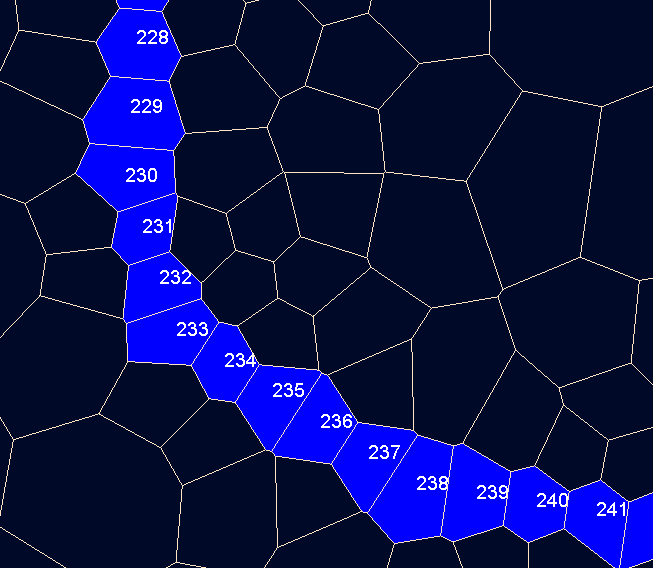 •Polygon or Polyline: Use this option to digitize one or more shapes and assign Boundary Condition attributes to the respective shapes. Use the left mouse button to start drawing and add attributes at the desired locations. Once you have finished digitizing, right click with the mouse to close the shape and select Finish button. •Cells: Use this option when you want to select individual cells to assign a boundary condition. Enter the attributes using the various methods; click Finish when you are done. This dialog allows you to copy and paste from Excel to make defining (or editing) the attributes easy. If your boundary condition is transient switch the schedule drop down to transient to enter your schedule. 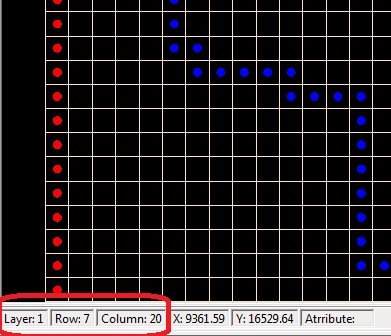 When you select the Edit... button you must select a cell containing the boundary condition you wish to edit. If preferred you can make your boundary condition edits by using the Scrip option. On this tab you will find the script for any edits you make on the Edit cells tab allowing you to learn the script language. You can re-use the script to "replay" your edits to your boundary conditions. The Setting window will load. 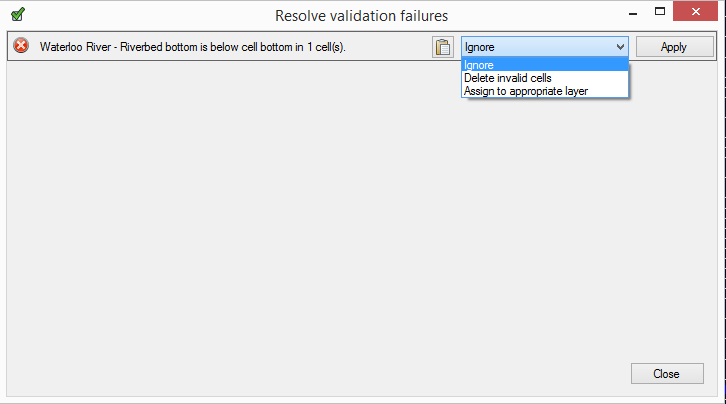 When selecting the Cells option, you will see the option "Show Cell ID labels"; turning this on will draw the Cell ID on top of the selected boundary condition cell type. This is useful if you wish to make edits to specific boundary condition attributes, as explained in the following section. 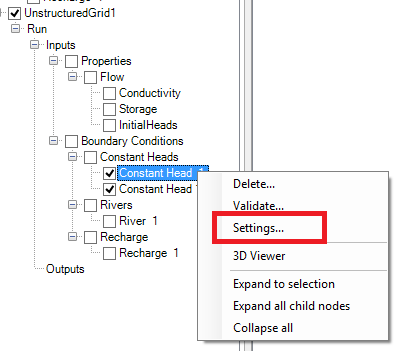 To delete a specific boundary condition cell group, right click on this node in the tree, and select Delete. To validate there are no warning or errors associated with a boundary condition, right click a specific boundary condition and select Validate... and if there are any errors or warning you will be provided an option to resolve the issue as shown in the dialog below. This is available for Constant Head, River, General Head, and Drain. It will check to see if the attributes of the boundary condition will place it below the bottom of the cell you assigned it to. Then it will give you options to correct this. If you choose to Ignore the errors you may encounter errors when trying to translate and run your model.